In my opinion, Alexander McQueen is not only the most influential fashion designer who ever lived but also the artist who has influenced me most in life. I love pretty much all of his pieces but the one that I could literally talk about forever is one in his Spring/Summer 1999 show. 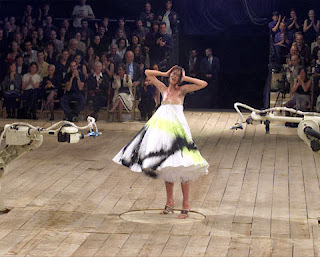 As a finale for the show, Shalom Harlow’s white cotton dress was spray painted black and white by two programmed robots from an Italian car factory. What makes it so special is how it is a mix of so many different areas and whether you’re interested in fashion or not it can still have some kind of impact on you. It is clear to see McQueen’s thoughts on the ‘dehumanising commercialism at the heart of his industry’. The machines made a one-off product, they were completely random. What I get from this is that maybe McQueen thinks that mass production in the fashion industry is wrong and ‘dehumanizing’. It takes away our individuality and our purpose to express who we are. I adore Alexander McQueen for being able to get across such a powerful message through fashion; an industry that many people believe to be pointless and unnecessary. There are many reasons I find this art piece so incredibly inspiring but the most important one is that it defines what I want to be in life, what I want to do with my life. I want to create art, through fashion. I want my work to have meaning and depth. I want to put across a message that everyone can understand, not just snobby ‘fashion people’. I want to make a difference and I want to change the way people perceive the world.